Michelle DePass, Director of the Tishman Environment and Design Center and Dean of the Milano School, and Joel Towers, Executive Dean of Parsons School of Design, testify at the People’s Hearing on Repeal of Clean Power Plan co-hosted by New York State Attorney General Eric Schneiderman, the New York City Mayor’s office, and The New School. When the Environmental Protection Agency (EPA) under President Obama proposed the Clean Power Plan in 2014, it hosted public hearings in four cities: Atlanta, Denver, Pittsburgh, and Washington. Americans used the platforms to provide spirited testimony both for and against the plan, Obama’s key climate change policy for cutting greenhouse gas emissions and promoting the use of renewable energy. The EPA has gone in the opposite direction under President Trump: Not only does the agency intend to do away with the Clean Power Plan, but it’s also limiting public input on the proposed decision, scheduling just one public hearing — in Charleston, West Virginia, the symbolic heart of American coal country. That did not meet with the approval of New York State Attorney General Eric Schneiderman, the New York City Mayor’s office, and The New School. 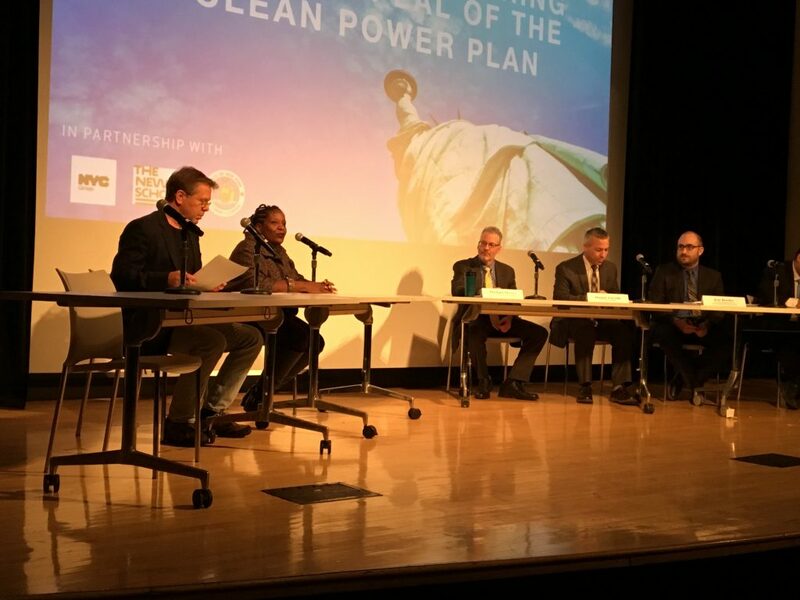 This month, they partnered to create another opportunity for individuals to make their voices heard: the People’s Hearing on the Repeal of the Clean Power Plan. Held at The Auditorium at 66 West 12th Street, the hearing attracted hundreds of local residents, including members of The New School community, as well as elected officials, who shared their thoughts on a move that could cripple the country’s effort to reduce the greenhouse gas emissions that harm the environment and human health. Kicking off testimony on behalf of The New School was Michelle DePass, Director of the Tishman Environment and Design Center and Dean of the Milano School at The New School. DePass, also a former Environmental Protection Agency (EPA) official who was appointed by President Obama to serve as the agency’s Assistant Administrator for International and Tribal Affairs, expressed her strong disagreement with the agency’s decision to repeal the Clean Power Plan. “The choice to repeal this plan reflects strategic negligence on the part of Scott Pruitt’s EPA,” said DePass, who was recently recognized by City & State as a 2017 CSR Responsible 100 Honoree. Citing the EPA’s 2009 Endangerment Finding, which declares that coal-fired power plants contribute significantly to atmospheric greenhouse gas pollution, DePass said that “repealing the Clean Power Plan contradicts the legally affirmed duty and purpose of the EPA and will have disastrous human health and climate impacts.” She pointed to EPA data showing that if the Clean Power Plan was enforced, it would prevent 300,000 missed days of work and school, 1,700 non-fatal heart attacks, 90,000 asthma attacks in children, and 3,600 premature deaths by 2030. Moreover, she said, failing to curb global climate change will result in “increasingly frequent and violent storms” that will damage the country’s infrastructure and undermine the economy and public safety. “Its effects will be most strongly felt by low-income communities and communities of color that are already overburdened with social and environmental injustices and harms,” she added. Towers stressed that “we are in a race to adapt to and mitigate the effects of climate change.” The EPA’s proposed repeal would delay necessary efforts to decarbonize the U.S. energy sector “at a time when the scientific evidence is overwhelmingly clear that carbon-based fuel resources must be replaced by renewable energy as quickly and responsibly as possible,” he said. “In that race, the Clean Power Plan is one strong policy tool that if properly employed will position the U.S. to play a leadership role in the economy and ecology of the future,” he added. Towers noted that it would also advance Trump’s stated goals on energy. The hearing also featured testimony from Ana Baptista, Assistant Professor in the Environmental Policy and Sustainability Management program, and Genevieve Guenther, a part-time lecturer in literary studies and a climate activist.